Like everything else in business, there is a risk attached to having a blog on your corporate website , and I thought long and hard before deciding to include one on mine. There are an awful lot of pitfalls associated with having the chance to publish texts directly to the internet without a second opinion, but at the same time there is an awful lot to be gained if a few simple rules are adhered to. Here’s five random ones that seem to recur. 1. Angry? Before you click “post”, THINK. Then don’t do it. Never post anything to your blog in anger. By all means, write the text and vent your frustration if you must, but stop short of clicking “post”- once something is out there on the internet it gains a life of its own and it can be very, very difficult to retract. 2. “In Vino Veritas” – except on the internet. If I had the time and the energy, I’d be tempted to start a campaign for a new class of global crime – Use of Social Media Whilst Under the Influence. How many times have you woken up after a night on the tiles, only to recoil in horror from your Facebook status update at four AM? Exactly. The same goes for blogging, which is even more dangerous when drunk- at least Facebook, Twitter and the like have the decency to limit the number of characters you can use, thus hopefully limiting the amount of damage you can do. A blog post, however, can be as long as you want it, and given enough social media rope most people can do a pretty good job of hanging themselves after a few glasses of sherry. Judging by some of the blogs I’ve read lately, people tend to have a very high opinion of themselves and their position in whatever industry they operate in – the problem is that for many of them, it doesn’t add up. The internet is full of guys with the Masters Degrees in Journalism from the University of Roadkill in Alabama, or “experts” who turn out to be interns who’ve just gotten e-mail access at their new posting. I had a run-in with one guy recently over a political communications article I wrote. He was working on the campaign of one of the parties I criticised and claimed to be some sort of “assistant director of elections”. It turned out he was 20 years old and had never even heard of the scandal that I had made reference to that so offended his political sensibilities. I make no secret of the fact that mine is a small company, dependent on a group of other talented entrepreneurs to deliver many of the services offered on this site. When I use the word “we” I’m referring to that group- NOT trying to give the impression that I’m Rupert Murdoch, with an army of outside broadcast trucks and Pulitzer prize-winners parked outside my door 24/7. The best thing you can do – especially if you run a small company – is to be yourself. Your customers will appreciate that far more than a bunch of bluster that can’t be backed up. People go out of their way to avoid advertising, turning off TVs and throwing radios out of eleventh-story windows to avoid the inane babble, so they’re not going to want to read about it on your blog either. By all means mention what you do and how well you do it, but only in reference to something relevant to them, not just you. 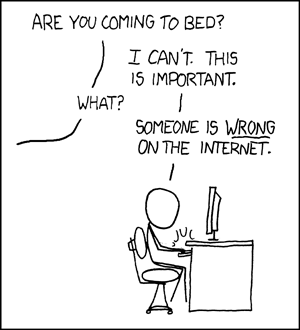 I find it astounding that no-one EVER admits to learning ANYTHING on the internet. No-one will ever say “you know, you might have a point there” – instead, everyone on the internet appears to know everything, and they cannot be convinced otherwise. I work regularly for a major news agency that has a policy of correcting every single error as soon as possible after discovery – in fact, one of the biggest mistakes you can make is to be made aware of an error and not correct it. The reasoning is very simple – if you get it wrong and admit your mistake, there is infinitely less damage to your credibility than if you continue to maintain that the moon is in fact made of cheese and the shape-shifting lizards decide everything. 6. Keep it short. No-one wants to read a blog for this long.